The new year was barely underway, but already things felt different. A baby Uni by the name of Indipsi sniffed the air timidly, a wave of coolness rushing up her pale pink nostrils. This year she was determined to stick to her New Year's resolution. Whatever that was, for as of yet she hadn't decided. Her owner, Charmedhorses, on the other hand, had already made one and broken it. So much for a year without chocolate. Indipsi didn't understand why Charmed had even attempted such a horrific thing. At the moment the Uni stood outside the pair's Neohome, atop a small hill. On all sides the little Neohouse was surrounded by vacant land, all of which was owned by Charmedhorses. Why they didn't do something with it, the Faerie Queen only knew, but Charmed was adamant that it should remain a part of the country and she would have it no other way. "Don't you ever get lonely out here?" Indi asked her owner when she stepped back inside. "Lonely? Are you kidding me? You've lived here your whole life. Have you ever seen me lonely?" "Well, I just thought living way out in the countryside might depress you." "Nope," Charmed shook her head. "I love it out here. It's just too bad we couldn't make some sort of profit off of it. I'm not real into Neopoints, as you know, but a girl's gotta eat." "And a Uni!" Indipsi chimed in. "But we're doing fine, aren't we Charmed?" "Say, have you made another New Year's resolution yet?" Charmed's brow wrinkled in thought. "No, but I'm considering my options. What about you?" "Eh, nothing to worry about," Charmed said easily. "We'll come up with something. Even if it's not until next year." "Right," Indi agreed. "We have plenty of time." The day passed quickly, with plenty of chores to be done and a house to be cleaned. It was as Charmed was outside mowing the lawn, or rather cutting it with a pair of scissors so that it was all even, that she decided that this could be handled much more efficiently if she had some extra help around the place. Sure, Indipsi helped around the place, but there was a lot of land for just two to take care of. Soon an idea came to Charmed. Actually, it was a New Year's resolution. She would just have to look into some things, make plans, and for the time being keep it a secret. Charmed didn't want to tell her Uni before she knew if her resolution would in fact be one to stick with. Meanwhile, Indipsi was keeping herself busy as well, with a room full of scattered toys and books. "This place looks like a Snorkle pen," Indi said with disgust. "Maybe my New Year's resolution ought to be keeping my room clean," Indipsi contemplated. Then she shook her head. "On second thought, that's even more unrealistic than not eating chocolate." As Indi continued cleaning, she wondered what her owner was going to decide on for a resolution. "Maybe we could do some kind of joint resolution," Indipsi thought aloud. "That way we'd both be able to work toward the same thing. It mustn't include food, though. I like food too much to give it up." "Indi? I'm going out for a bit!" Charmed called to her Uni. "I'll be back in an hour or so!" "Where are you going?" Indipsi asked, stepping out of her room to speak to her owner. "I've just got some business to attend to," Charmed replied with a win. "I have a meeting with my real estate agent." "Oh, okay," Indi tried to act normally, despite her peaked curiosity. "See you later, then." Charmedhorses nodded and left the Neohome. With her owner gone and the Neohome all to herself, Indipsi was left to wonder why Charmed was off to meet the real estate agent. "It must have something to do with her New Year's resolution," Indipsi decided. "What do real estate agents do, though?" She thought this over. "They buy and sell property. Oh, no! Charmed must be moving. Moving?" Indi couldn't imagine living anywhere else. Why in Neopia would Charmed want to leave the countryside? "Well, I guess that's that," Indi said sullenly. "I shouldn't be cleaning, I should be packing." During the time that Charmed was gone, Indipsi managed to lug a dozen cardboard boxes to her room in preparation of their move. Indi figured that she might as well accept the move as best she could, so she wouldn't feel remorseful later. But honestly, how could Charmed do this without consulting her first? As Indipsi continued fighting with her feelings, Charmed finished her little errand and returned home. "Hey, Indi! I'm back!" Charmed called as she walked through the front door. "Hi, Charmed. How was the real estate agent?" "Fine. He had lots of good things to tell me." "You'll see," Charmedhorses winked again. What's with the winking? Indi thought to herself. Stop winking! "Well, I've got some things to see to," Charmed said. "Can you keep yourself busy until dinner?" "Yeah, I have some packing to do anyway." "Packing? Why are you packing?" "In case what?" Then Charmed seemed to lose interested, distracted by other thoughts and left Indi alone in her room. "In case you decide to go crazy and sell the only Neohome I've ever known," Indipsi said bitterly. Charmed, in the meantime, had already gone to her own room, where she kept a small vault filled with valuables and Neopoints. Charmedhorses proceeded to open this safe and take out a large stash of said objects. Indi knew, for she was peeking in on her owner's action. "The new Neohome must be mighty expensive," Indipsi determined, eying the now nearly empty safe being returned to Charmed's hiding spot. As Charmed pocketed the Neopoints, Indipsi quickly turned back to the hallway so she wouldn't be caught spying. "I have a feeling I'll be making a huge New Year's resolution this year," Charmed said, joining Indipsi. "And I have a feeling that my resolution will be dealing with your resolution," Indipsi muttered under her breath. Things looked no better in the light of the next morning and when Charmed said over a breakfast of scrambled eggs, "I'm off again to see my agent," Indipsi had to keep herself from whinnying in protest. "Again?" She tried to keep her cool. "Yes, we didn't quite finish yesterday," Charmed explained. "I'm afraid I may be gone a bit longer today, but by the time I come back I'll tell you what my resolution is." "Oh joy," Indipsi said through barred teeth. "I can hardly wait." Charmed failed to notice her Uni's sullen mood and continued on her merry way, packing a small backpack and once again leaving Indipsi on her own. "Looks like I've got plenty of time to pack," Indipsi said to herself. "I don't see why Charmed's trying to keep it a secret. Her real estate agent, all those Neopoints, New Year's resolutions, it's so obvious that we're moving." "As Indipsi packed up her toys she thought sadly back to all the happy memories she had had there. "Why would Charmed want to leave? She's always said, since I was a foal, that the country is where she belongs." 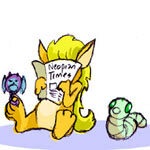 The baby Uni had gone for a snack in the kitchen when she discovered a pamphlet that Charmed had carelessly left out. "Well, that doesn't make any sense," Indipsi said aloud. Holding the pamphlet in her hoof, she flipped through it. The brochure was filled with images of grazing Kau and Ixi and a detailed description of a big red barn. Also on display was a table of prices and fees. What it would cost for a white picket fence and how expensive padded stalls would be. "Charmed's not trying to put me away somewhere, is she?" Indi wondered. "No, that can't be." Indipsi wavered again. "Or would she? No, she wouldn't. I know Charmed. Or do I?" By the time Charmed got home, Indipsi was practically pacing throughout the rooms, driven wild by that which was unknown to her. "My faeries! What's wrong with you?" Charmed exclaimed upon her arrival. "Indi, are you alright?" "I don't know. Am I?" Indipsi asked. "Come, come. Sit down, Indi," Charmed said hurriedly, running to help her Uni off her hooves. "What's gotten into you?" "How was your meeting?" Indipsi inquired shakily, without answering her owner. "Oh, just fine, thank you. I've got some great news." "Don't bother telling me. I already know we're moving," Indi whispered. "Moving? Why whatever gave you that idea?" A look of concern crossed Charmed's face. "Of course we're not moving. I love it where we are." "Then why did you have those meetings with your real estate agent? And what about all those Neopoints you took out?" "There's a simple explanation for all that. My New Year's resolution." "Seeing as we have all this land," Charmed began, "I'm going to have a farm built on it!" Indipsi's eyes grew very large. "A farm?" "Yes, so we'll have fresh milk and eggs every morning. Isn't that wonderful? Think of all the friends you'll make! Kau, Ixi, Peadackles, Snorkles. It'll cost a pretty Neopoint, but we'll make a nice living off of it eventually." "A farm," Indipsi's mind was swimming with relief and excitement. This had to be the best New Year's resolution ever!